We have 1 Dairy Cow. 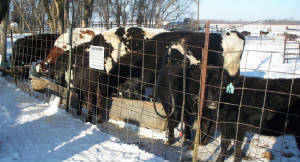 To learn more about Dairy Cows please read the article below the pictures. Thanks!!!! Milkyway is an 2004 holstein cow. She is very gentle and quiet. We have had her the longest. She is halter broke and meets you at the gate. When most consumers think of a dairy cow, they think of Holsteins. Although the Holstein is the most popular breed, there are actually several types of milking cows found in Wisconsin. Here is some basic information on the different cow breeds. breed originated in northern Holland and Friesland. Beef from Holsteins is becoming quite popular due to the increase in demand for lean beef. Guernsey: Guernseys are called "the Royal Breed" because their milk is almost gold in color. Guernseys were first raised by monks on the Isle of Guernsey. They are a shade of fawn (brownish), either solid or with white markings. than other dairy breeds and produces milk with average butterfat content. Brown Swiss vary in color from light brown to dark brown or sometimes gray. Ayrshire: Ayrshires originated in the county of Ayr in Scotland. They are reddish-brown with many spots. They first came to America in 1822. They are less popular in Wisconsin than the other breeds. Milking Shorthorn: Milking Shorthorns are from northeastern England and best known for their versatility. They efficiently convert feed to milk but are also very good meat animals. The Milking Shorthorn has short horns and a stocky build. Their color ranges from red to red-and-white to roan color. Jersey: The Jersey cow produces milk very high in butterfat that is desirable for the making of butter. They originated on the Channel Island of Jersey. The Jersey cow tends to be a golden-brown color with a black nose and black hooves. Jerseys are the smallest of all dairy breeds and have large, brown eyes. • Cows did not always look like they do today – or produce as much milk. They used to roam wild and early humans hunted them for food. • Later, people began domesticating cows and milking them. People also began to raise calves, which meant they didn’t have to hunt for more wild cows. • Man milking cows is mentioned 44 times in the Old Testament of the Bible. • Christopher Columbus brought the first dairy cow to America on his second voyage. Early settlers brought dairy cows to Wisconsin. • Each of the six breeds of dairy cattle – Ayrshire, Brown Swiss, Guernsey, Holstein, Jersey and Milking Shorthorn – developed in its own country. • Brown Swiss is the oldest breed and developed in the Swiss Alps. During the summer, the cows are taken to high mountain meadows where they roam free and graze. Brown Swiss still wear cow bells so farmers can find them in foggy mountain pastures. • Guernseys are called “The Royal Breed” because Guernsey milk is almost gold in color. Guernseys were first raised by monks on the Isle of Guernsey. They are a shade of fawn (brownish), either solid or with white markings. • Jerseys come from the Isle of Jersey, very close to the Isle of Guernsey. Jerseys are the smallest of all dairy breeds, with large brown eyes. They vary in color but are generally brown, sometimes with white markings. • Ayrshires originated in the county of Ayr in Scotland. They are reddish brown with a lot of spots. They first came to America in 1822. They are less popular in Wisconsin than the other breeds. • Holsteins (or Holstein Friesian) originated in the Netherlands. 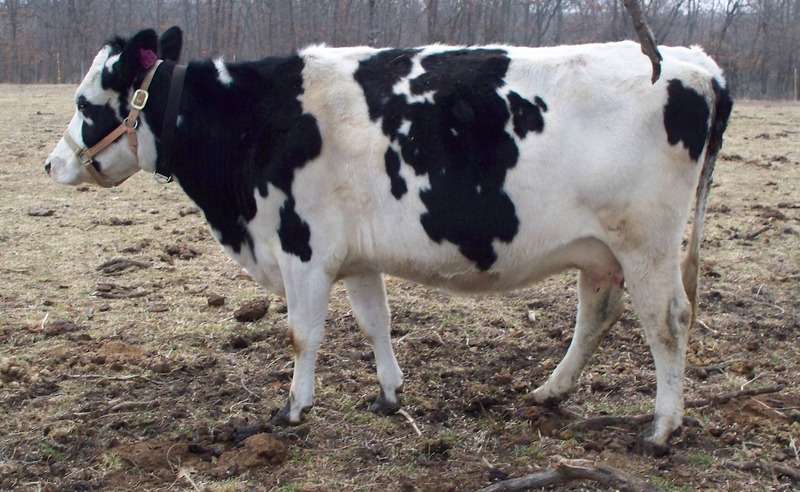 Dutch settlers probably brought the first Holstein cattle to America about 1621. More than 90% of all dairy cattle in Wisconsin are Holsteins. Although most Holsteins are black and white, there are some of red-and-white color. • Milking Shorthorns are from northeastern England and best known for their versatility. They efficiently convert feed to milk but also are very good meat animals. • Cows have an acute sense of smell – they can smell something up to six miles away. • An average dairy cow weighs about 1,400 pounds. • Cows can live to be about 18 years old, but a normal productive life for a Holstein is around six years. 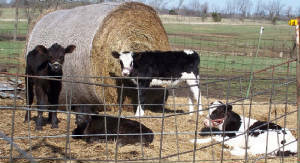 • A newborn calf weighs 90 pounds and can walk on its own one hour after birth. • Cows spend an average of six hours each day eating and an additional eight hours ruminating and chewing their cud. Most cows chew at least 50 times per minute. • Cows graze by curling their tongues around grass and pulling rather than nibbling it like a horse does. • Cows have four stomach compartments and consume about 90 pounds of feed every day. They also drink the equivalent of a bathtub full of water – about 25 to 50 gallons – every day. • If people ate like cows, they would have to eat about 360 cheeseburgers and drink 400 to 800 glasses of water every day. • Contrary to popular opinion, cows sleep lying down – just like people! • A Wisconsin dairy cow produces an average of five to seven gallons of milk each day. That’s more than 100 eight-ounce glasses of milk. • There are approximately 340 to 350 squirts in a gallon of milk. • Wisconsin is home to more than 1.2 million dairy cows.